The French EuroVision Lab. drew attention to its research on strategies to connect with so-called ‘non-visitors’ and, against this background, employed especially artistic projects in a museum setting as a means of changing perspective. With this goal in mind, the COP Toolkits were discussed and examined with numerous partners in the run-up to the French EuroVision Lab. Among these museum partners were the Centre Georges Pompidou, the Musée d’Art Contemporain du Val-de-Marne, the Musée de l’air et de l’espace, the Musée des Arts et Métiers, the Louvre Museum and the La petite Galerie. During the Lab. 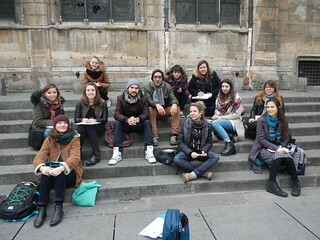 phase, the French project partners took these discussions as a starting point to conduct closely interconnected workshops with students, museum experts and artists. Moreover, the French team focused on adolescents with a migration background as a specific target audience. In an attempt to spark their interest in museums, members of this target group were for example invited to take part in school workshops on Exemplary COP-Units such as Europe in a Balloon. As a result of the successful collaboration between artists, university staff and museum experts, the French Lab. presented – among other things and in addition to its various workshops – two intervening art projects in museums, each of which was based on one of the Exemplary COP-Units that were developed for the EMEE project. At Saint-Omer, Musée de l’Hôtel Sandelin (Pas-de-Calais), which is an art and history museum, contemporary artist Marie Hendriks showed her work, which was dedicated to cultural transmutations between Chinese and European chinoiserie. Her art project was also made a subject of discussion during visitor workshops. Moreover, contemporary artist Jérôme Progin explored the findings of coins from numerous European locations on the battlefield of Peene and put his work up for debate at the Maison de la Bataille Noordpeene. While planning their Lab. 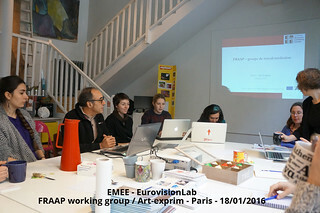 activities, the EMEE partners from the Paris- Est Créteil University were able to benefit from their cooperation with the Federation of Visual Artists and Authors Network (FRAAP), which had been intensified during several workshops over the course of the duration of the project. Furthermore, and as part of their Lab. activities, the French partners showed the Young Scenographers Contest and its concepts of how to present transregionally re-interpreted objects at four locations in Paris. The awarded works of EMEE – Young Scenographers Contest will be on display in this travelling exhibition which will remain open from March 2016. These workshops aim is to acquire professionnal skills in order to develop activities, following the concept of Change of Perspective. Using the resources developed and proposed by the EMEE-project, participants are challenged to participate in several workshops that will happen throughout the year 2016. Exploration activities of Europe, for master students and young teachers, with the resources developed and proposed by the EMEE-project. A diversified program is created, which allows the participants to reinterpret objects in a European perspective. The activities outputs will be displayed in the University and on Social Media platforms. Young teachers develop research about cultural partnership and implement pedagogical projects with target groups. A series of workshops is held in partnership with the FRAAP, in order to disseminate the knowledge and to stimulate new approaches in the regions. Two specifics projects are developed with contemporary art associations, Art-Exprim and Espace 36. Report: ‘Cultural activities, european perspectives and target groups’. A series of EuroVision Lab. activities of UPEC-ESPE in close cooperation with ‘La FRAAP’ comes to its end. Report: EMEE EuroVision Lab. in France October 2015 – January 2016: Five steps to implement the concepts and tools of EMEE in practise with master students – A summary.